Equities start the day lower as we continue to struggle with one specific question: What’s priced in? Now this is a question that the market is always concerned with, in fact not only does this question have no real answer it pretty much gets asked every single day. But in this case we’re asking ourselves “what was the market pricing in on Christmas Eve when it threw up all that egg nog?” Well, from my seat it appeared to be pricing in a rapid global deceleration not only in economic data but in earnings and sentiment. We had fallen 20% from the highs and the term “imminent global recession” started to get thrown around alongside “Merry Christmas”. 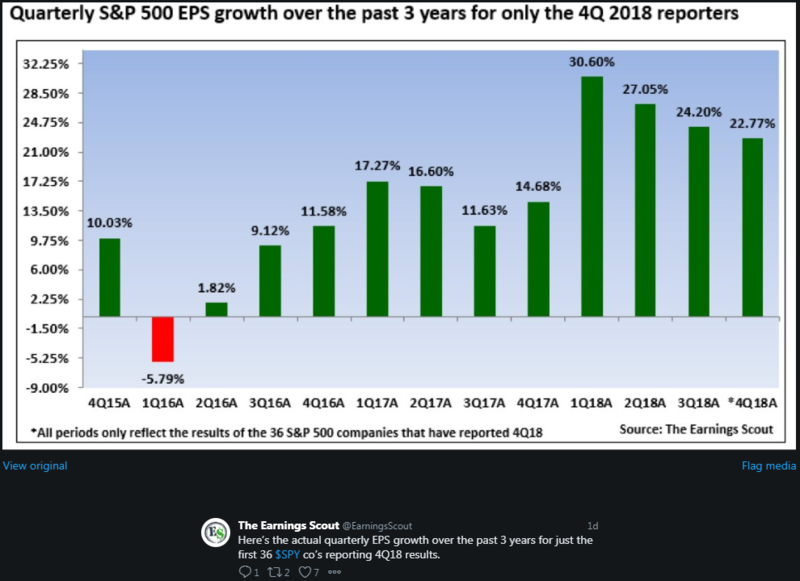 Luckily for us earnings have just kicked off so we can get a look at 4Q 2018 as well as guidance about the next 6-12 months from corporate leaders. This week we saw a slew of bank earnings and something unusual happened: names like C, WFC, JPM, and a few others traded LOWER pre market but by the time the bell rang closed solidly in the green. What’s priced in? Had expectations about their earnings plummeted so much that these banking titans jumped over a broomstick? It’s possible, sure, and this is a good time to remind you that “it’s not the news that matters it’s the reaction to the news”, but had we priced in too much negativity? Was that move in December too severe to the downside? Only time will tell but the initial wave of earnings haven’t been all that bad. Has earnings growth slowed? OF COURSE IT HAS, the tailwind from tax reform was bound to subside, let’s not act like that’s a big surprise here, but is a recession imminent? Baird strategists say no and I’m inclined to agree with them. The Christmas Eve lows and what lay beneath was about an imminent recession and a full blown Bear market. As of this morning that continues to recede in the mirror. After the open, early morning buying showed up like it has the past few sessions and propelled us back towards the 50day MAVG. I’ll admit that I thought 2,600 was going to be harder to get thru then it was (took us one attempt) so let’s see if we can grab this 50day and never look back! We got a few notable earnings from MS, CSX, DPZ, and FAST so let’s briefly talk about the first 3 then focus on FAST. MS whiffed and actually got punished falling 4%, CSX missed, fell 1%, and the last things Bulls want to see is a transport acting poorly (it doesn’t sound that bad though). DPZ reiterated their guidance at an investor day and the market is so worried about a recession that a $254 pizza company rose 4% (can you sense the sarcasm? I put an extra helping on that one). Speaking of recession, FAST reported and the stock jumped a juicy 5.5% (we rate neutral). If you don’t know what FAST does they are an industrial distributor so they are super sensitive to economic cycles. They did complain about “choppiness” in the 4th Q but nowhere did they sound any alarm bells about the economy. Sure, they are dealing with headwinds like tariffs and falling margins but I poured thru 6000 lines of text and 82 analysts saying “hey guys great quarter great color” to try to find something super negative and I couldn’t (do you guys HAVE to say that every time?). What exactly were we doing on Christmas Eve? What were we pricing there? In the afternoon we saw a headline from the WSJ that the US is “weighing lifting China Trade Tariffs” and the market RIPPED. Straight up, thru the 50 day, and Bulls were all sorts of giddy. But, it turned out to be fake news, got repudiated, and we gave it all back. Sigh. Boy who Cried Wolf. I mean at least we know what the market is thinking right? If I could speak to the President I’d say “Hey, Mr President, sir, Donald, pass me a Big Mac and one of those double cheese and let’s talk about the fact that if you end this negotiation and declare some kind of victory you could get a huge rally out of stocks. Look what a fake headline did!” Alas, I am stuck in the frozen upper Midwest, doomed to write blogs about markets and never advise the President. THANK GOD. 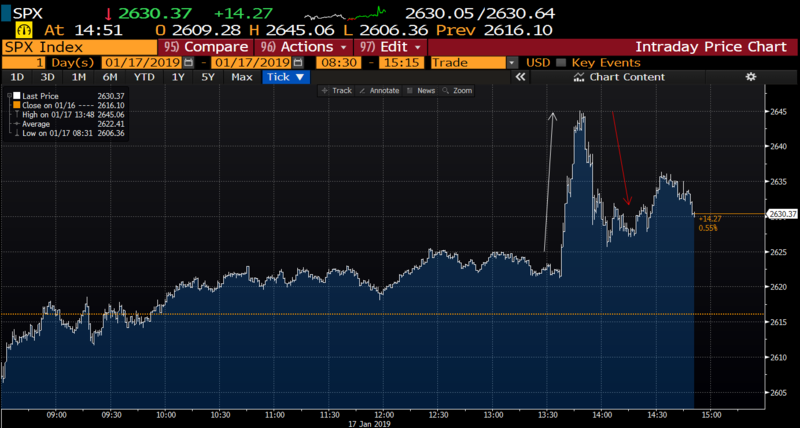 Succinct Summation of the Day’s Events: Fake headlines aside, earnings haven’t been as bad as whatever the market thought was happening on Christmas Eve. Slowly putting things back together. Jack Bogle died yesterday, a legend in the investment community. I wanted to say one brief thing about him because there are others who are more eloquent than I. Bogle helped drive down the cost of investing and that’s an amazing legacy. This chart from @ericbalchunas shows how big of an impact he had. But remember this: he drove down the cost of investing, not the VALUE of financial advice/planning, those are two separate things. Advisors provide immense value by helping clients navigate behavioral biases and tricky markets that would otherwise send them fleeing at the wrong point in time crippling their financial future. The firm Bogle founded is just one arrow in the quiver that they can use to help people sleep better at night when events like December 2018 rear their ugly heads. I always have fail gif’s in my links, how about someone who has things under control! Great quote from Bogle in this Ben Carlson blog post: “Well, you can only control what you can control. I think whatever your view of the world is, you have to invest. The alternative is – I mean, the only way to guarantee you will have nothing at retirement is to invest nothing along the way. So, you have to take your chances”. You can’t make this up, we’re at the point in this market selloff where Bloomberg is writing articles about investing in Legos. I mean, look, I can dig on hard assets. I have a basement featuring fermented grapes from all over the planet. That being said, I’m not sure I’m willing to part with the ’83 Margaux for a LEGO Kylo Ren because it’s uncorrelated with FANG. WHHATT IS HAPPENING !!??! !